SACRAMENTO, Calif.—Impassioned speeches asking Californians to stand together against tyranny were heard at the state Capitol on Aug. 31, when around 200 human rights activists gathered to show support for SJR 10—a state resolution that condemns the Chinese Communist Party for its ongoing persecution of Falun Dafa practitioners. 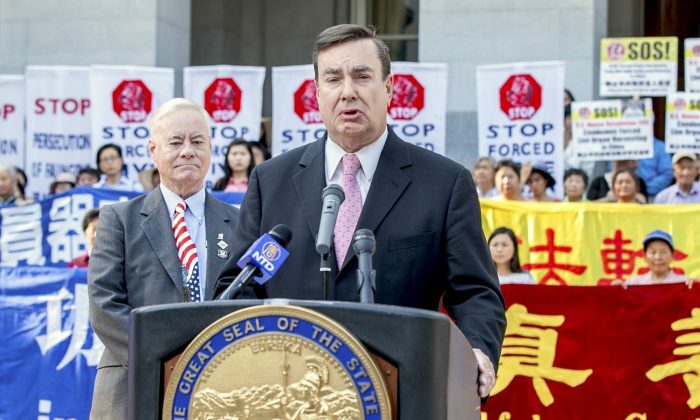 State legislators, as well as three survivors of the brutal persecution, implored Californians to stand together against the “egregious state-sponsored violence,” as one senator put it, that is now occurring in China. On Aug. 29, the resolution had passed the judiciary committee hearing unanimously. But then on Sept. 1, the day following the rally, the state Senate unexpectedly voted to refer SJR 10 back to the rules committee—essentially blocking it from coming to a vote in the Senate. The action appears to be the direct result of interference by the Chinese communist regime in American governmental affairs. That day, members of the Senate received via email a threatening letter on the stationary of the Chinese Consulate in San Francisco. “We would like to urgently draw the attention of the California legislature to SJR-10,” the unsigned letter begins. “This may deeply damage the cooperative relations between the state of California and China,” it continues. Later, the letter points out the high level of trade between China and California, the great number of tourists from China who visit the state, and the fact that China is the largest source of foreign students who attend California’s colleges and universities. The author of the resolution, Republican state Sen. Joel Anderson, knew that passing an official condemnation of China’s human rights abuses would not be easy. Falun Dafa, also known as Falun Gong, is a traditional Chinese spiritual discipline that consists of performing gentle exercises and living by the principles of truthfulness, compassion, and tolerance. First brought to the public in 1992, it spread rapidly throughout China, and by 1999, there were 70 million to 100 million people practicing. Fearing its popularity—there were more Falun Gong practitioners than members of the Communist Party—then Chinese leader Jiang Zemin banned the practice and enlisted the nation’s entire security complex, media, and judiciary to participate in a massive persecution campaign that continues today. The persecution over the past 18 years has amounted to genocide. At the rally, Anderson used this weighty word and called for it to be stopped. “In World War II, there were deniers who said the Holocaust didn’t exist, who said it wasn’t happening. We now know that the Holocaust happened and that millions of Jews lost their lives. 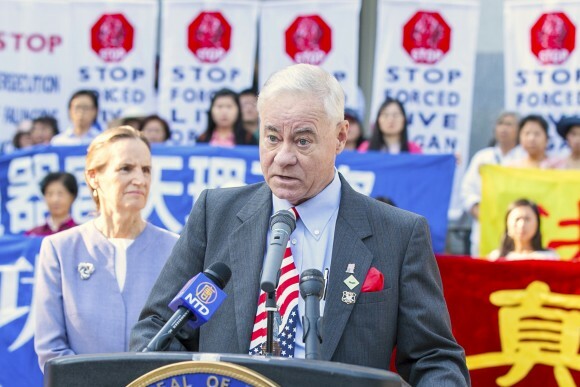 I will not stand by and watch millions of Falun Gong practitioners lose their lives,” Anderson said. “If you feel strongly and you believe that nobody should be persecuted or executed for their body parts because they practice a faith, then you need to call your legislator and tell them that they need to stop genocide in China,” he said. 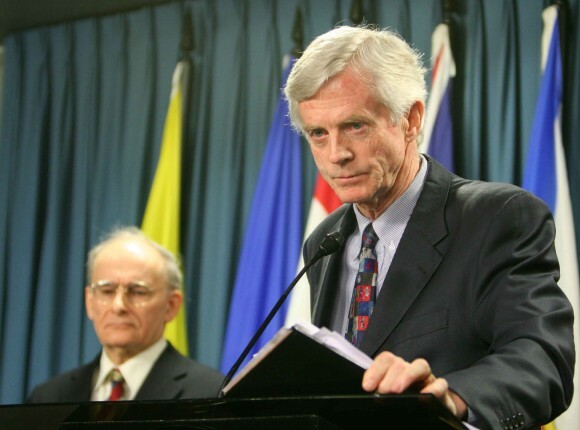 Anderson was referring to the murder of Falun Gong practitioners to supply China’s flourishing organ transplantation industry. Kilgour and Matas determined that the allegations were true. In 2016, Kilgour and Matas, joined by Ethan Gutmann, author of “The Slaughter: Mass Killings, Organ Harvesting, and China’s Secret Solution to Its Dissident Problem,” released an updated report. The researchers analyzed hospital revenue, bed counts, bed utilization rates, surgical personnel, training programs, state funding, and more, and concluded that China performs between 60,000 and 100,000 transplants per year—not 10,000 as the regime claims. The authors determined that most of the organs come from Falun Gong practitioners, with a lesser number from other prisoners of conscience drawn from Tibetans, Uyghurs, and House Christians. The rally was in part a celebration that the resolution had passed the judiciary committee and in part encouragement, to help whip up support for the resolution in Senate. Joining Anderson in authoring SJR 10 were four state Assembly members—Democrats Adrin Nazarian and Cristina Garcia, and Republicans Randy Voepel and Tom Lackey—making the resolution a bipartisan effort. Voepel also spoke at the rally, affirming the importance of the resolution and the message it sends to the Chinese regime. “It makes the vital statement that we stand against oppression—against a regime that wants to control the minds and bodies of its own people,” Voepel said. “Organ harvesting is big money over there—it’s an underground economy. 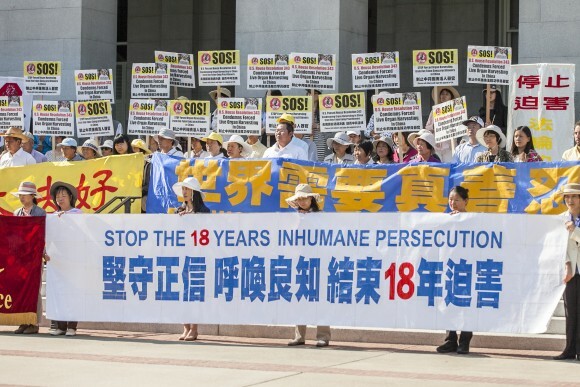 Three Falun Gong practitioners who now live in California also spoke, sharing heartbreaking stories of being arrested, brainwashed, and brutally tortured simply because they would not give up their beliefs. They also described how, while held in the labor camps, Falun Gong prisoners were targeted for regular blood tests and brief medical exams—odd, considering the regime did not care for the health of prisoners it was torturing. They believed these tests were for the purpose of establishing a living organ bank. One medical researcher compared detained practitioners to lobsters in the tank in a seafood restaurant, ready to be plucked out whenever needed. David Xu was a financial software engineer in China. His good friend was tortured to death while imprisoned in 2011. In April 2016, Xu feared it was his turn. Kidnapped from his home, he was taken to a brainwashing center where he endured extreme torture. The most frightening moments for him were when his blood was taken. He was well aware of the regime’s practice of harvesting the organs of Falun Gong practitioners and was terrified for his life. He went on a hunger strike for 18 days before he was released. His story is echoed by Jie Li and Yolanda Yao. Speaking to the crowd, they both shared chilling stories of imprisonment, torture, and mysterious blood tests. They saw fellow practitioners beaten mercilessly before one day disappearing. She spoke of being subjected to around-the-clock brainwashing sessions and unrelenting mental and physical torture while imprisoned in Beijing Women’s Labor Camp. When she was forced to sit in a child’s chair for 10 to 11 hours every day, her legs and feet would swell immensely, resulting in severe bruising and ulceration in her back and hips. She was also forced to perform to slave labor in summer temperatures surpassing 100 degrees, and was once soaked in pesticide when the 70-pound barrel she was carrying on her back leaked all over her. The most horrific thing she experienced, however, was the blood tests she and fellow Falun Gong practitioners were given three times a year. Like Xu, she was aware of the forced organ harvesting and was certain that their blood was being tested to evaluate them as potential candidates. Although she is safe in California, her heart is still in China with her elderly parents, who are both imprisoned for their beliefs. “The suffering and torment I experienced in the labor camp still haunts me to this day. It horrifies me to know that my parents are suffering the same fate,” she said. Stephen Gregory contributed to this report.